I have a question regarding shopping through a portal. Before any online purchase, I usually go to evreward.com to see where I can get the most bonus points. 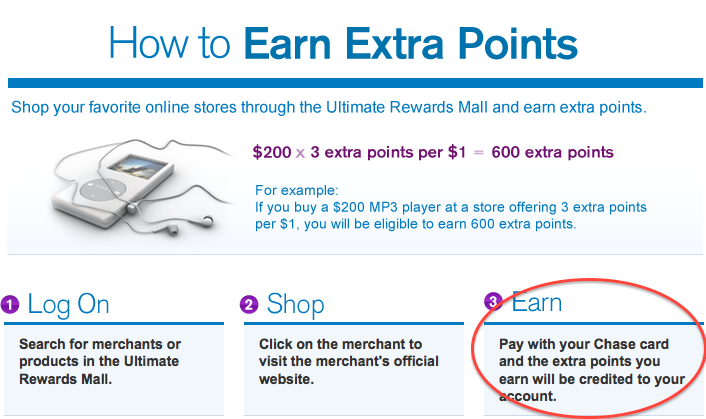 For the sake of this example, let’s say it’s the Chase Ultimate Rewards Mall. When I click on the link, I get asked to login to my Chase account, then pick a credit card (I have the Sapphire Preferred and Freedom). Let’s say I pick the Sapphire Preferred, when I check out, can I pay with another credit card (my SPG Amex), and still get the bonus points through the mall, but get the base point for the spend on the Amex? Great question – let me take it back a couple steps for the beginners. If you shop a lot online, you should be raking in the points and miles by maximizing shopping portals. The general rule of thumb with these portals is that as long as you click the link and make a purchase, with any credit card, you will get the points/miles. Why do these portals exist? Well usually they are run by third party e-commerce websites that act as a middle man. The retailers pay the portals, say 7%, of your total purchase, for sending business their way. In turn, the portals incentivize you to spend more by offering miles and points that they purchase from the airline for less than what they are getting paid by the retailer. In an ideal world everyone wins: the retailer gets more business, the shopping portal makes money for basically doing nothing, the airlines make money from the portals on the miles (that they hope never get redeemed) and the savvy shopper rakes in miles when those poor souls who actually shop in the store get the shaft on the bonus opportunity. The great thing is that you can pretty much use any credit card – you don’t have to use an airline or credit card-affiliated product. For example, say you want to buy a $100 item from Target and you want to maximize the miles you get, but you’d really like to top up American Airlines if it’s the best. 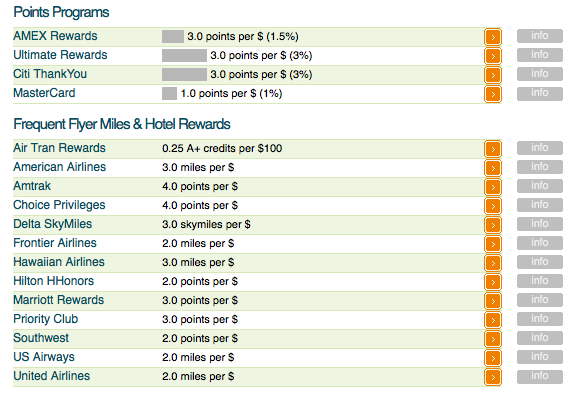 I’d first go to EVreward.com and compare how many points/miles each portal is offering. I’d generally prefer accruing Chase/Amex points because they are transferable to a number of different partners, but neither partners with American and the earning ratio is the same, so I’d go directly through the AAdvantageeshopping.com portal for this purchase. Now, you don’t have to use an AA-affiliated credit card, so you could use your United Club credit card which offers a lucrative 1.5 miles spent on every purchase. In the end you’d end up with 300 American miles from the portal (deposited usually within two weeks of purchase) and 150 United miles from the credit card spend. As Jean-Marc writes, it gets a little trickier with the credit card shopping portals, because they try to make it seem like you need to use their credit cards to get the points, however you don’t. In order to accrue points in Amex Membership Rewards and Chase Ultimate Rewards you need to have an eligible card (like Amex Premier Rewards Gold or Chase Sapphire Preferred), but you don’t have to use that card through the portal. Once you click through, a cookie gets placed on your computer that tells the system to award you X amount of points for your purchase. Usually the cookie lasts for at least 30 days, so even if you forget to click through the portal on a future visit, it’s very likely you will still get the bonus (though I always recommend clicking through to be safe). The systems are not sophisticated enough to cross-reference the type of credit card used to actually make the purchase. Additionally, many portals will exclude the purchase of gift cards from accruing points/miles, however the systems often do not detect gift cards and you will still get the bonus. On top of that, sometimes you can even then use those gift cards after clicking through the portal and potentially earn miles on purchases paid for by those gift cards – a classic double dip. Note, it doesn’t always work out as planned and there are variations between vendors and portals on what works and doesn’t, so I’d recommend starting off small and see what works before you try to go big time. FYI for those with the new Ink Bold card which offers 5 points per dollar on office supplies, the Frequent Miler blog has some really unique ways to maximize that via gift card purchases through shopping portals. Last week I had the pleasure of meeting Greg, the brains behind Frequent Miler, and I’m really impressed with his creativity in the spend/gift card/portal space. I’ve even added him to my blogroll, so check him out!